Business cards play a key role in a photographer’s career. They are an important element, helping you represent yourself and your work to potential clients. When you’re covering an event or a photoshoot, you can hand out your photography business card to others—and ask them to keep you in mind for their own special occasion. Of course, boring black and white business cards won’t cut it for photographers. You need a business card with an attractive, vibrant design to impress people with your creative abilities. And to showcase your photography! This collection includes some of the best business card templates for photographers that are easy to edit and customize. Best of luck on your journey as a photographer, and we hope one of these business card designs helps you land your next gig. This amazing business card template comes with a mixed modern and creative design that will help grab your client’s attention. It allows you to showcase photos on both front and back of the card to show off your skills and creativity. The template also comes in 3 different color variations. Featuring a unique and a modern design, this photography business card template is perfect for presenting yourself as a professional. The template includes a dark design that also allows you to showcase photos on front and back sides. You can customize the template using Photoshop CS5 or better. Another photography business card with a unique design. This template also features an uncommon design where you can showcase your photos and present yourself as a creative-minded photographer. The template is available as a 3.5” x 2” size PSD file. This business card template will allow you to show off your own unique style with its casual and quirky design. The template is fully customizable and allows you to include a photo of your own on both sides. You can edit it using Photoshop. A dark and elegant business card template made for photographers. This template also includes image placeholders on both sides and has a luxury-themed design. The template comes as a fully-layered PSD file to let you easily customize it to your preference. Who says you can’t take your photography portfolio in your pocket? This business card lets you do just that. The template comes with a design that allows you to include lots of photos from your portfolio on the front side of your business card. The template comes in 3.5 x 2-inch size and can be customized with Photoshop. This is a creative and a minimalist business card template that features a clean design. While it doesn’t allow you to add images, the unique template design will clearly help present yourself as a photographer to your potential clients. This business card template is the perfect choice for designing a card for a photographer, especially since it allows you to include a photo as the background. You can use this design to show your skills by using a creative photo as the background. The template comes in both Illustrator and EPS file formats. For photographers who appreciate minimalism, this is the perfect template you can use to design a beautiful business card. It comes as a fully-layered PSD file, which you can edit and customize however you like. The template also features an image background for one side for adding a photo that captures your work. If you’re a fan of classical designs, this template business card template will be perfect for you. Featuring a split-page design, the template allows you to add a photo and include your logo or name at the same time. It’s available in both Illustrator and EPS file formats. Business cards with vertical designs are quite popular among photographers. This template also comes with a vertical design with space for showcasing a photo. The backside of the business card can also be customized to a color of your choice or include a photo. Another creative business card template with a photo background. This template is ideal for photographers who work with nature and outdoor photography. The template can be edited with Illustrator and features CMYK colors for printing. This colorful business card template comes with a beautiful design that allows you to showcase your creativity. The template is fully customizable and it’s ideal for fashion and creative photographers. The backside of the template is also creatively designed to grab attention. A business card template that features a minimal and an artistic design. It’s perfect for photographers who work with art photography as well as creative work. The template can be edited with Illustrator CS4 or better and features organized layers for easier editing. This business card template comes with a modern design that will help capture your own style with its design. The front side allows you to use a photo-based background and you can also use a pattern or a photo as the back side frame as well. This is a business card template designed specifically for photographers. It features a frontside that allows you to include many photos to create your own mini portfolio. The backside also includes a creative design to highlight your details. The template is easily editable with Photoshop. If you’re a fashion photographer or someone who does a lot of model photoshoots, this template will allow you to create an effective business card to win over new clients. The template features a beautiful frontside where you can include a photo and a backside that clearly showcase your details. 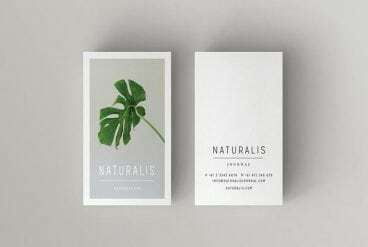 Naturalis is an elegant business card template that comes with a minimal design. You can showcase a photo as the front side of the card and include your contact details on the back. The template is available in both portrait and landscape versions as well. This creative template also comes with an image background for showing off your photography skills and features a modern design. The template comes in Illustrator and EPS file formats. Another beautiful business card template made for professional photographers. The template features a modern design with space for a photograph and your logo. It can be customized with Illustrator. Looking for a mockup for your design? Check out our creative and corporate business cards mockups collection.